KITCHEN-store food, grains, nuts, sugar. RESTAURANT/BAKERY - Quick access to ingredients, seals airtight. GARAGE-Tools,Screws, Parts,fertilizer and other hardware. PAINT-Seal and Keep Paint Fresh. BOATING/CAMPING-Store water or Food and keep bugs out. AUTO-Store used or New Oil towels and Tools for easy reach. FISHING-Makes a great Bait and Fish Bucket Better. PICNICS-Quick and easy Ice Drink Storage. All Around Best Seal Lid on the Market. The Gamma Seal lid is a solid solution to the pain of finger-nail breaking on old style Plastic Pail lids. A Plastic pail with a stand flat lid can be used only a few times and the Lid has to be replaced. a pail with a The Gamma Seal lid can be used unlimited times.! The Screw Top lid is not only resealable, but the super heavy duty construction allows it to be reusable over and over again. This 5 Gallon Gamma Seal Bucket Lid can be easily resale your Plastic Pail! or Can Transforms your New Plastic Pail into an airtight STORAGE CONTAINER! Millions of Plastic Pails are manufactured each year. Many are trashed because of the absence of an easy resealing lid. Gamma Seal lids transform most standard 12" diameter pails into certified leak proof, airtight storage containers that protect the contents from exposure to the sun, air, and water. Plastic Pails are excellent storage containers for the long term food storage, tool storage, garage and auto parts storage..
Gamma Seal lids are an economical alternative for organizing and storing just about anything you can think of. Gamma Seal lids do not require a cutting tool or lid removal tool to open. The lid is removed with a lite turn of the top. 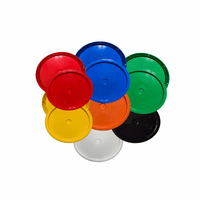 This Gamma Seal lid can be used to color code all your items for easy identification. 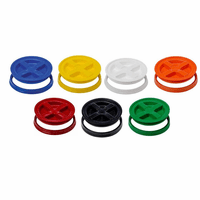 BEST PRICE FOR GAMMA SEAL LIDS IN CASE QUANTITIES. GAMMA SEAL LIDS SCREW OFF COVER HEAVY DUTY, TRANSFORMS YOUR BUCKET OR PAIL INTO AN AIRTIGHT STORAGE CONTAINER"
HI-DENSITY POLYETHYLENE GAMMA SEAL LID CREATES A LEAK-PROOF AIRTIGHT SEAL. 5 GALLON GAMMA FITS 12" DIAMETER PLASTIC PAILS & 2 GALLON GAMMA FITS 9 7/8" DIAMETER PLASTIC PAILS. 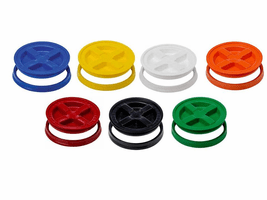 RESEALABLE AND REUSABLE GAMMA SEAL LIDS. FDA APPROVED MATERIALS. Easy to install with a wooden or rubber mallet. Just a lite tap on the inner adapter ring with your mallet and the lid is installed. See Video for exact installation instruction. The Gamma Seal Lid: the raw material used in manufacturing is Formolene LH5206, High-Density Polyethylene (HDPE). Formolene LH5206 meets all requirements of the U.S. Food and Drug Administration as specified in 21CFR 177.1520, covering safe use of polyolefin articles intended for direct food contact. The gaskets for the lid and the adapter are made from SBR (styrene-butadiene Rubber copolymer) and coated with an FDA approved silicone lubricant. The pigments used in manufacturing are heavy metal free. The raw material listed above utilized in the Gamma Seal Lid and Vittles Vault Containers, HDPE, is fully recyclable. The Recyclable classification for HDPE is # 2. New Lower Price (Online Web Sales Only). We have been in Business Since 1983 and The Plastic Resin Prices are at the lowest since we opened for business. Now is the time to take advantage of the new lower Plastic container prices. We are A Gamma2 Master Distributor. Call For Wholesale Pallet Load Price. As low Asa $3.98 for Multiple Pallets. Reviewed By: Bob (Hot Springs, Arkansas) This was my fifth order from BayTec for Gamma Seals. Customer service is friendly and efficient. They have every color, even Purple, no other company had Purple Gamma Seals, Perfect for Mardi Gras. Reviewed By: Jane (Salt Lake City, UT) I tried buying from another Gamma Seal Lid company in Ohio but they way over-charged on the shipping charges. BayTec Containers good not be beat on the total price. I bought a case of these and just love them. They make opening buckets a breeze. BayTec has the cheapest Price I have found on the Internet. Gamma Seal Lid converts plastic 3.5 to 7 gallon buckets into airtight storage container. Great for pet food or any shop need. Gamma2 Seal Lid uses a special gasket to make an airtight leak-proof seal. Each Gamma lid is made in the USA from BPA free. Thes Bucket Seal Lids or made from.FDA approved food grade plastic. These Seal Lids will convert a bucket or pail into a easy open, airtight and pest-proof safety storage container. They will fit virtually any 12" diameter bucket (3.5- to 7.0 gallon), Each Gamma Seal provides an airtight lid ion order to protection all the contents. There are thousands of storage uses. The air seal gasket helps keep air out in order to avoid contaminants. The Gamma Seal Lid Stackability is also easy to handle. Many Food Grade Colors. FDA Approved Food Grade Plastic. BPA free. Included parts: Screw on/off threaded lid with gasket Adapter ring with gasket. Bucket not included. 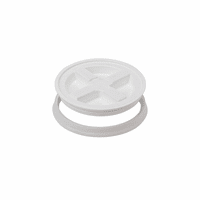 Replacement gaskets for lids are available.